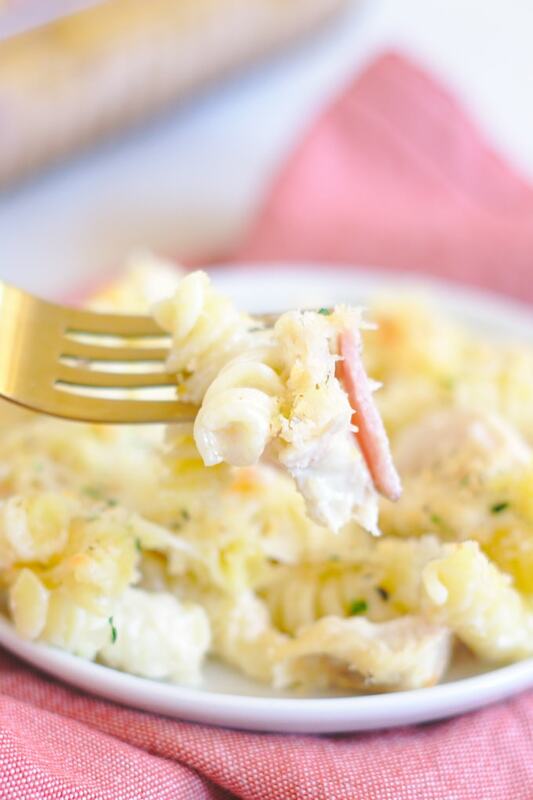 Chicken Cordon Bleu Casserole is a fun spin on a classic meal! 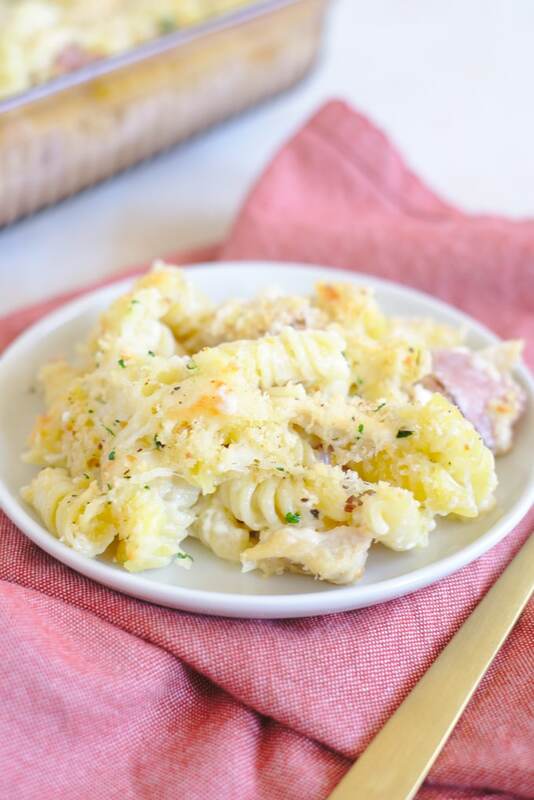 Chicken, ham, and pasta topped with a creamy cheese sauce and baked until golden brown. 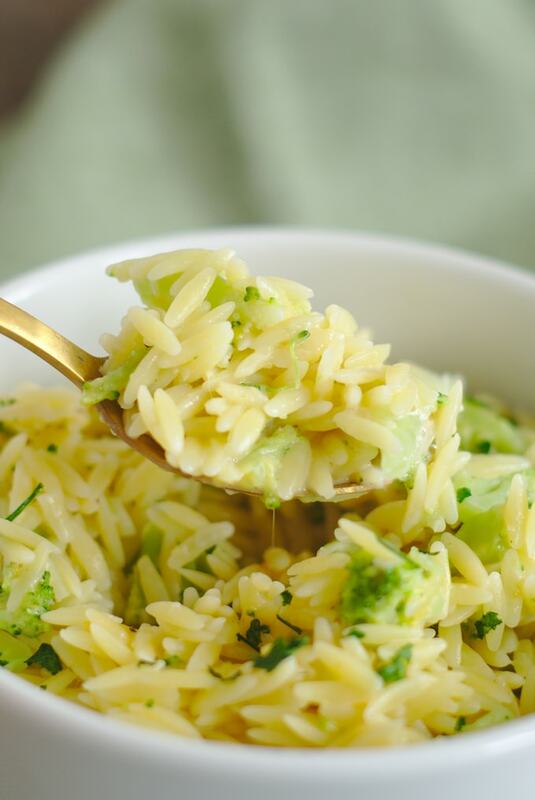 This casserole is a great way to feed a crowd! 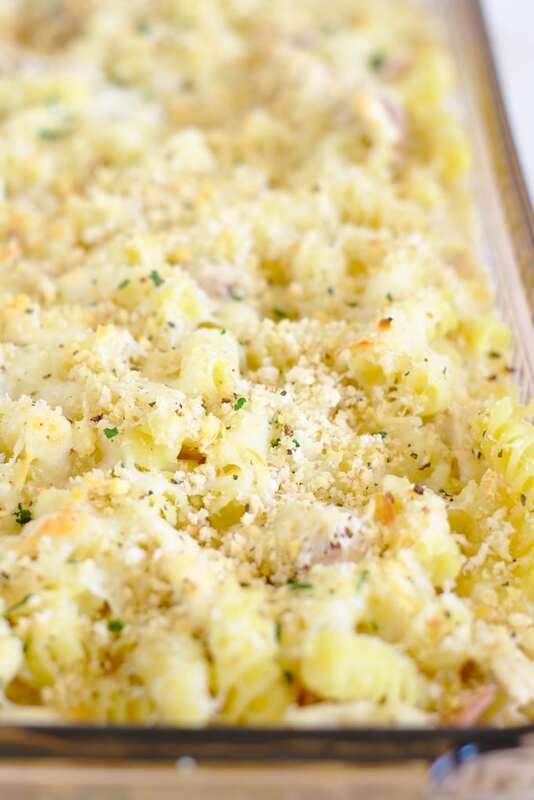 This chicken cordon bleu casserole might just be the greatest casserole recipe ever! It is so much easier to make than regular chicken cordon bleu but it has the exact same great flavors! This casserole is perfect for those busy weeknights where you just want a simple and delicious meal that your whole family will love! I was amazed at how quickly the whole casserole disappeared at my house, even the pickiest of eaters loved it! The leftovers of this casserole heated up quite well, I suggest popping it in the oven again until it heats up rather than microwaving it to avoid it getting soggy. No one wants a soggy casserole! If you cannot find shredded swiss, you can use sliced swiss instead for the top. Either works perfectly to create that wonderful, crispy cheese crust on top. This recipe is a great way to use up leftover ham after the holidays! If you don’t have any leftover ham on hand, you can either use sliced deli ham or cubed ham. I wanted to use cubed ham for this recipe but they were out at the store! Leftover chicken works in this recipe too! If you don’t have any leftover chicken, put 2-3 chicken breasts in a pan and bake it for 45 minutes or until cooked through at 375 degrees. This recipe makes about 6-8 servings so if you are just cooking for 1-2 people, half the recipe and bake it in an 8″x8″ pan. Don’t know what to make for dinner? 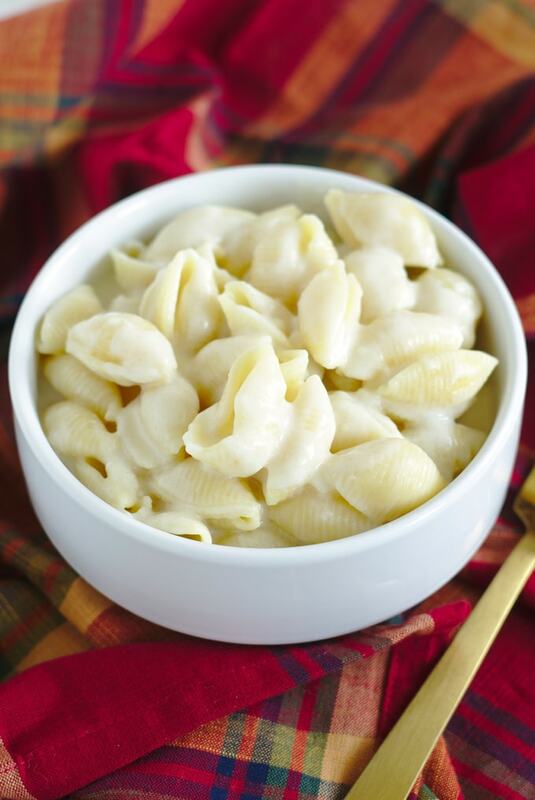 Try these other easy pasta bakes! More great ways to use up leftover ham! In a medium saucepan, melt butter over medium heat. Add in garlic and cook for 2-3 minutes, stirring continuously. Add in heavy whipping cream, milk, Worcestershire, dijon mustard, salt, pepper, mozzarella, and parmesan. Bring to a simmer and cook for 8-10 minutes, stirring occasionally. The cheese should have melted into the sauce. Pour sauce over cooked and drained pasta. Add in chicken and ham, stirring well. 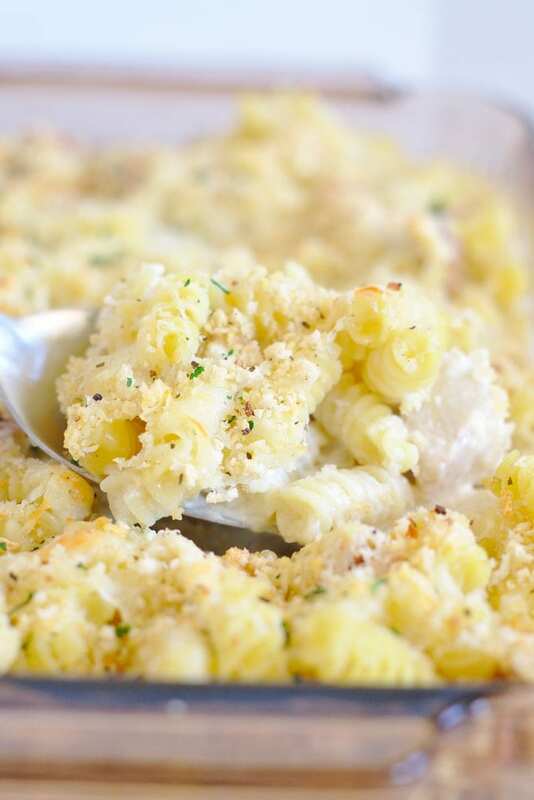 Pour into a 9-inch x 13-inch pan and top with swiss cheese and breadcrumbs. Bake for 25-28 minutes and serve hot. 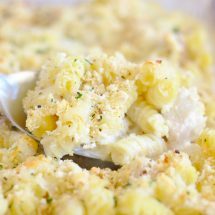 Make sure to check out these amazing pasta recipes!